Lasy week my toddler was recovering from the croup and we just hung out at home a lot. He was energetic enough to do a few fun simple activities but wasn't ready to be hanging out with friends. He's been loving the rainbow projects I've done with his big sister (my preschooler) so we decided to do a simple rainbow project with beads. 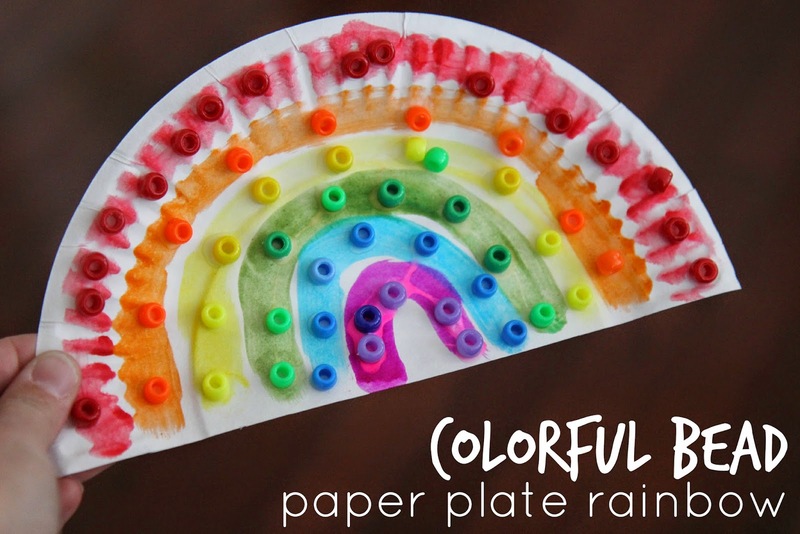 Today I'm going to share how we created these colorful paper plate rainbows with very few materials! Prep ahead your paper plate by cutting it in half and drawing a rainbow on it using markers or dot paints. Older kids can draw their own rainbow. Next sort the pony beads by color into different bowls. My son is 2 years 4 months and really loves color sorting so this was fun for him. If yours isn't interested in that then you can pre-sort the beads. Next just add a stream of glue on one color of the rainbow. Have your toddler add several colors to that color of the rainbow and then another stream of glue on a different color. Slowly add beads to each color of the rainbow. If it is easier, just add large drops of glue on different spots on the rainbow. 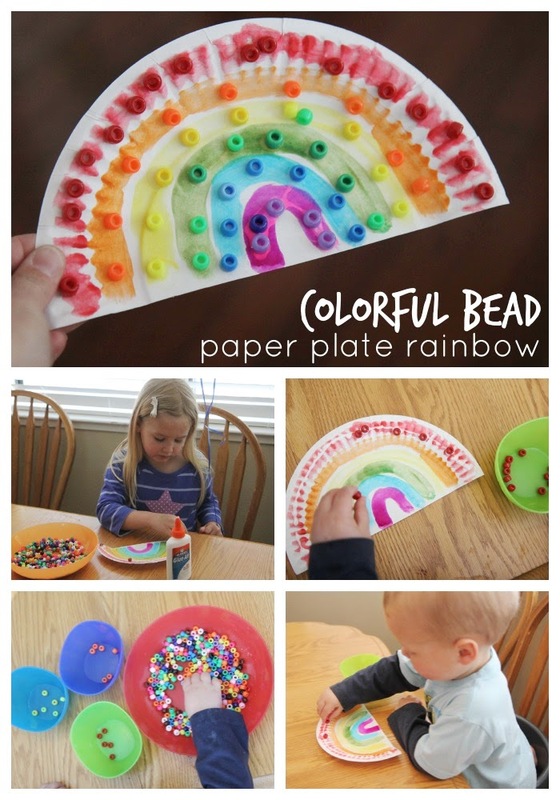 Once your little one is done adding beads to their rainbow then set it aside to dry. We just had the best time chatting while we did this beaded paper plate rainbow. We talked about the colors and where we were putting each bead. Later in the day I did this activity with my preschooler and she was more interested in sticking her hands in the beads and letting beads fall through her fingers again and again than creating a rainbow... so you'll definitely find that each child is different and not all kids will enjoy this project. PLEASE NOTE: As with all activities I share, this project needs to be done with adult supervision. Please skip this project or modify it if you have a child who is always trying to eat things like beads or other small items. My toddler who did this project occasionally mouthes things but it is rare, so I feel totally comfortable doing supervised activities using beads with him. I would not have done this with my daughter at the same age since she tried to eat everything! Please use your judgement as only you know your child and his/her abilities. Have any other ways that we could adapt this? Have any other favorite materials we could use as we make this project? This is so cute! I love how you added variations like "use Froot Loops." I would not have thought of that.